What the heck is a Makeup War? The Makeup Wars group blog blasts about the same topic about every other week. We link to each others' posts through the themed graphic at the top of the post (see the last mascara, next mascara links) and the blog logo/photo links at the bottom of this post. We encourage you readers to click the links and scroll through all of our blogs to see our favorite mascaras! Our posts all go live at the same time. So, finding out what other Makeup Wars bloggers picked is a surprise to me too! I am always so eager to click through to find out what everyone picked! Did you miss our last few Makeup Wars? Be sure to check out those posts here: Battle of the Taupes, The $20.00 Face Challenge, Battle of the Favorite Summer Lippie, the Most Expensive Face Challenge, the Best Brush, Favorite Fall Polish, Favorite Red Lipstick, Best Fall Look, Halloween Manicure, Favorite BB Creams, and Favorite Mascara. While I do love metallic eye shadows, I decided to focus on metallic polishes for this post. As I browsed through my makeup collection selecting my favorites, I realized that I might just have a metallic polish addiction! Seriously! I didn't really even realize how many I had until I started picking through them and swatching them for this challenge. 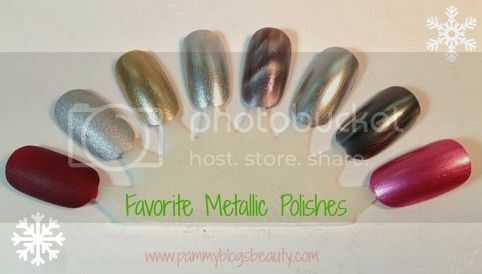 To see what my favorite metallic polishes are, please keep reading! I really love metallic polish! While it can be worn year-round, it is especially fitting during the holidays. Even someone who tends to gravitate towards more natural looking nails can rock a metallic this time of year! I think of it as jewelry for your nails. With metallic polish, you really can transform your nails into a shiny and sparkly accessory! As I mentioned, I seem to have a bit of a metallic polish addiction, lol! In particular, I can't get over how many silver-toned metallics I own. So, I sorted through everything and am only showing you my favorites! Side note: My cuticles and nails are in rough shape ya'll! Typically, I would swatch these for you on my nails. However, I am in the midst of a 2 week nail treatment. So, no polish for me for a couple weeks. If you are curious about how I got into this state, please read on. The dilemma: With taking care of a baby full time, I wash my hands constantly. Add in the change of weather and being out of my HG nail strengthener...well, these cumulative factors wreaked havoc on my nails and cuticles. So, I repurchased my nail treatment and stashed moisturizers all over the house. Hopefully, this will do the trick! Check back soon for an update as I will be posting about my ongoing quest for better nails and cuticles. Out of my massive nail polish collection, I pulled 8 favorite metallic polishes. As I mentioned earlier, most of my metallics tend to be in the silver family. However, I do have some other shades as well. 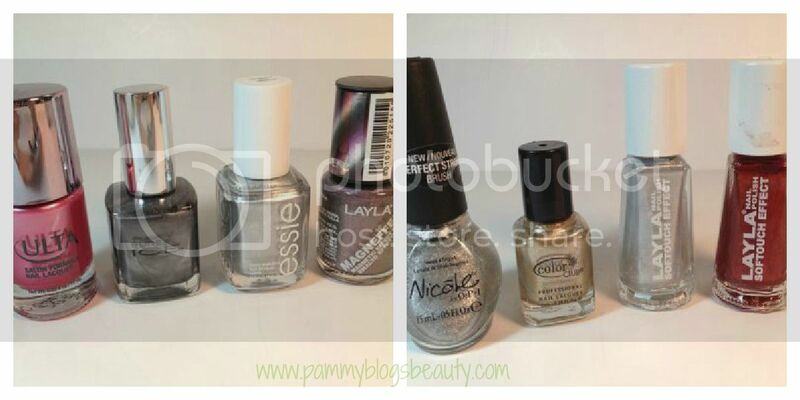 Note to self: Stop buying silver metallic polishes! lol! I literally do not need to buy another silver metallic for years! So, here they are! I am listing them right to left just how they are pictured and swatched. Ulta Salon Formula Nail Lacquer in Pink Marble: This is my newest polish purchase! Actually, I got this bottle with my Ulta rewards points. I seem to almost always go for a bottle of Ulta polish with those points. How do you like to "spend" your Ulta rewards points? I am a pink lover at heart! As much as I like the bolder colors that are popular in Fall/Winter, I love having a Pink Metallic to add in the mix! The metallic finish makes this pretty shade very Holiday appropriate! Pure Ice Polish in Eyes of Steel: This is a deep and dark charcoal Grey shade. It was from their "Five Shades of Grey" promotion that I reviewed. I honestly think that this deep charcoal shade is more flattering to my skin tone than a brighter silver metallic. Have you tried Pure Ice polishes? They really do have great quality considering that they are less than $2 each! Essie in No Place Like Chrome: This essie polish was a recent Klout perk! It is a gorgeous and shiny liquid metal finish light silver metallic. Now, while I love the shade, I have noticed that I can only wear this when my nails are in top condition. This polish shows any flaws. So, if you have peeling or chips in your nails surface, you will need to smooth those out before you apply this bad boy. The overall effect of this polish? Like jewelry for your nails! Layla Magneffect Polish in #15 Glamour Lilac: Ooooh! I love Magnetic Polishes!!! They are just so fun. I admire nail art but just don't have the time nor skill. Magnetic polishes are a great way to get a cool "art" effect without any extra skill or time, lol! When applied and magnetized this polish looks like a shimmery and somewhat glittery lavender charcoal over a silver metallic. Just gorgeous! Nicole by OPI in Give Me the 1st Dance: I am such a huge fan of Nicole by OPI polishes. I tend to gravitate towards these even more than the regular OPI line. I think it is because I am a trendy teenager-at-heart. I mean, lol, this polish is from the Justin Beiber Nicole by OPI collection (lol, no, I am not a fan of his music...but can appreciate it, sorta). Sorry, I digress, back to the polish! If I was going to post about only one metallic polish, one top favorite, it would be this one. This silver is *gorgeous*! It is a true bright silver. The shade is just a tad deeper than the Essie No Place Like Chrome that I mentioned above. Also, the finish is glittery as well as metallic. This pretty polish is so gorgeous and festive! I am not sure if it is still available since it is from a limited edition collection. Color Club Disco Nap: This pretty gold metallic came in my November Birchbox! Don't ya'll just love getting a polish in your beauty sample boxes? Birchbox completely introduced me to Color Club Polishes. I am now a huge fan of the brand! My skin tone is neutral. However, I lean a bit more towards cool tones. So, in general, I stick to more silvers than golds. Yet, this polish is a very wearable gold for me! It is not "too yellow". Plus, it is just nice for me to switch it up from silver to gold once in awhile. Layla Softtouch Effect in #01: Yes, there is a lot of Layla in this post! I don't have a ton of Layla polishes. However, the ones I have are favorites! If you missed my review of the Softeffects polishes, please check that out. These polishes are textured polishes with a matte finish. So unique!!! Just had to include these (this one and the one listed below) in this metallics post. This is a light glittery silver metallic with a matte finish. Gorgeous! Actually, it is so similar to the Nicole by OPI Give Me the 1st Dance in shade but different in finish. So pretty! Layla Softouch Effect in #07: If I had to pick a 2nd favorite of the polishes mentioned in this post, this one would be it. It is my quintessential go-to shade for the Holidays this year! It is a gorgeous deep brick red matte finish metallic. The shade is so flattering! Very chic! So, that is it ya'll! 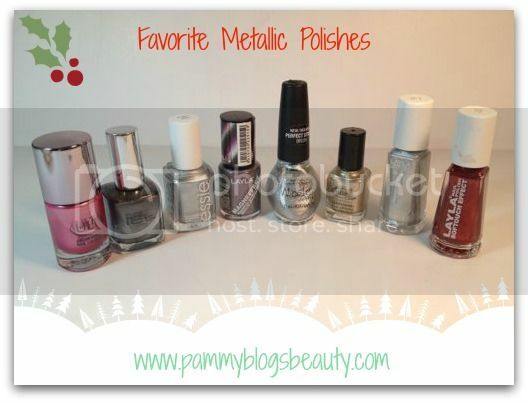 Those are my top favorite metallic polishes! What are your favorite metallic polishes? Thanks for reading! Be sure to check out the links below to see what the other Makeup Wars bloggers picked for their faves! Those are all so great! Whoaaaa! You've got way more metallic polishes than I do. I'm just a wee bit envious. That Layla is absolutely gorgeous! Oooh. Nail Polishes!!! Yes. You are addicted, just like me!! I really like the Pure Ice Polish in Eyes of Steel! @B-The Layla polishes really are amazing! Pricey, but so unique! I adore metallic nail polishes and had one for part of my post but decided it was long enough. I've never heard of a matte metallic. That sounds fun. These are all beautiful. I think I'll look at Ulta for more Layla and their brand now. These are all lovely but the Pure Ice Polish in Eyes of Steel is stunning!! @Marcia-The matte metallics by Layla are so cool! The texture is really cool and it is just such a fresh look. OOOOh! I want that Layla Polish!!! Oh I love that Layla Magneffect! So pretty! I'd never even heard of that brand.